At Centerless Grinding Services, we have a team of skilled operators with a strong background in working with all different types of metal. This particular job involved cutting-to-length and grinding of small diameter brass rods targeted for use in a research & development project at a leading University. With incoming rods measuring 0.250" in diameter and a finish diameter requirement of 0.187", our economical approach consisted of using a rough grinding process to get the diameter closer to size. 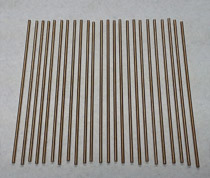 Once adequate stock was removed, we cut the work pieces to 7.5" ±0.010" lengths, precision straightened them to a T.I.R. value of 0.010" along the entire length, and finish ground them to size with close dimensional tolerances of +0.000/-0.0004" on the diameter. The technical competencies of our workforce combined with state-of-the-art grinding equipment allowed us achieve this high degree of accuracy on all 6,250 units in this order. 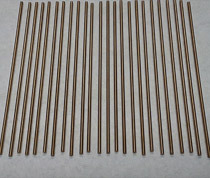 Final operations consisted of polishing the rods and packaging them for shipment. Our disciplined and systematic methods for quality assurance involved dimensional and visual inspections throughout the entire process. 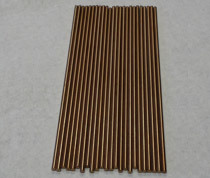 We carefully packaged and delivered the finished rods to the clients in a timely manner with all required documentation. If you are interested in learning more about this project or how our range of precision finishing services can benefit your operations, contact us today.